Michael McFadyen's Scuba Diving - Arorangi School Passage The western side of the island of Rarotonga in the Cook Islands has a higher proportion of resorts and general accommodation than the rest of the island. This part of the island is called Arorangi. From the boat ramp at Avatui Harbour it would be about 15 to 18 minutes to this area. You pass by the airport and Black Rock (a very prominent landmark on the western side) and places like the very large Edgewater Resort. However, when I did it, we went from the beach west of Vaimaanga on the southern side of the island (you travel via the Rutaki Passage back pass the Rarotonga Resort - about 12 minutes). The finging reef that almost totally encloses Rarotonga is about 100 to 150 metres off the island at this location. You will see that there is a small local primary school here, a fairly obvious feature from the water (you are a little south of the westernmost point of the isalnd). This school is called Arorangi School. Since this is located off the school and off a small passage that gives very small vessels like canoes to the inside of the reef, the dive site is called Arorangi School Passage. The anchoring spot is 30 metres off the fringing reef. This site consists of a series of ridges and gullies running west-north-west. The depth at the anchoring spot is about 10 metres. The bottom is a sandy bottom that gradually slopes to 18 metres. Here the ridges start. They drop to 30 to 35 metres. The bottom at the end of these ridges appears to be 45 to 50 metres. Like all the other spots I dived in Rarotonga, the coral here is not very good. I estimated that there was only about 15% live coral. I also saw no sponges at all and not even a tiny gorgonia (let alone a huge one like seen in many South Pacific Ocean countries). Near the end of the ridge we followed we saw about 20 spotted eagle rays in the distance. However, we could not get close enough to get a photograph. There were some blue, yellow and pink Christmas tree worms in the coral, one of only a few locations that we saw them. There were a few giant clams, although not too huge. Fishlife was also sparce. 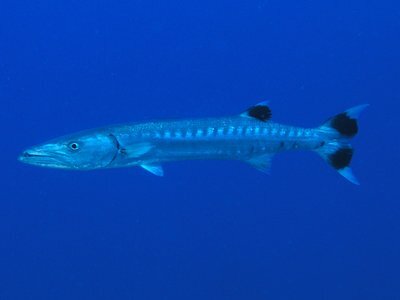 We saw four barracudas and a few bluefin trevally as well as a nice Guineafowl moray eel and some large octopus. 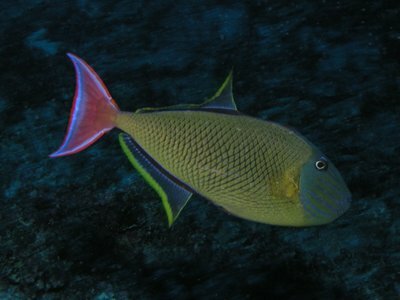 There were a few surgeonfish and trevally, some different butterflyfish (threadfin, longnose) and a few Moorish idols as well as some triggerfish. That is about it except for heaps of black sea cucumbers.